Form these easy, scrumptious two-ingredient Chocolate-Marshmallow Clusters for a quick treat! 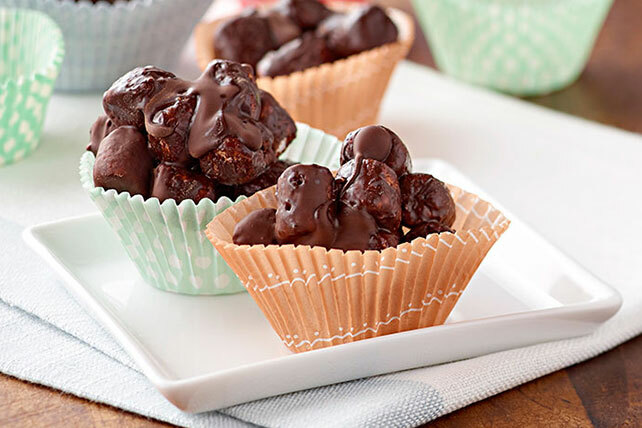 Our Chocolate-Marshmallow Clusters are great for bake sales. Drop rounded tablespoonfuls of marshmallow mixture into 24 mounds on baking sheet sprayed with cooking spray. Add 1/2 cup chopped PLANTERS Peanuts or chopped buttermints to the marshmallows before tossing with the melted chocolate. Microwave chocolate in small microwaveable bowl on HIGH 1-1/2 min., stirring after 1 min. Stir until chocolate is completely melted. Continue as directed. Enjoy a serving of this simple treat on occasion. Prepare using 1 cup BAKER'S Semi-Sweet Chocolate Chunks.